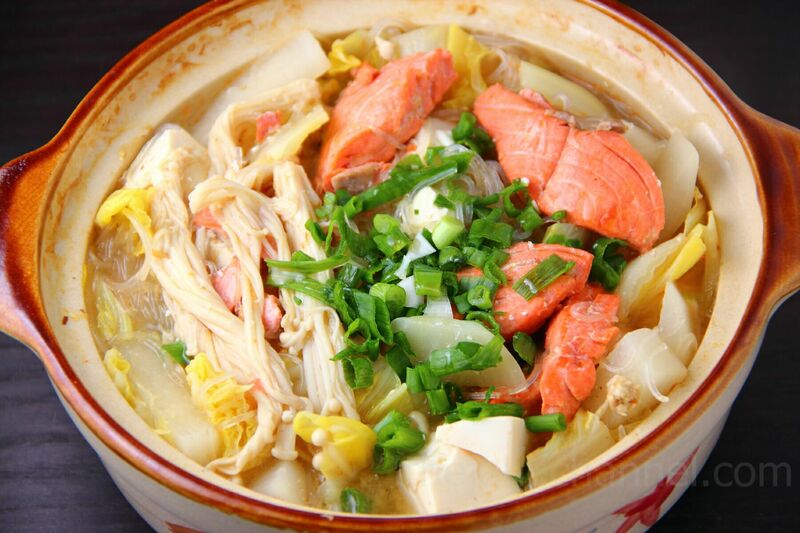 Ishikari is a Japanese version of a salmon soup served in a hot pot. The soup is miso based, and has various types of vegetables in it. The dish originated in Hokkaido, northern Japan, where winters are particularly cold. 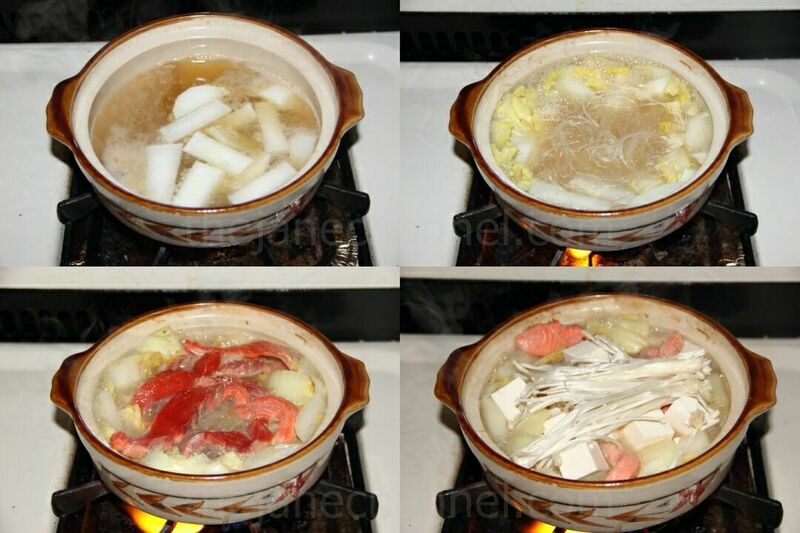 Hot pot style dishes are great for the winter as the hot soup helps warm one up. The salmon and tofu in this dish provides good sources of protein that can keep one full and feel warmer even longer. Serve with a steaming hot bowl of rice for the perfect meal. 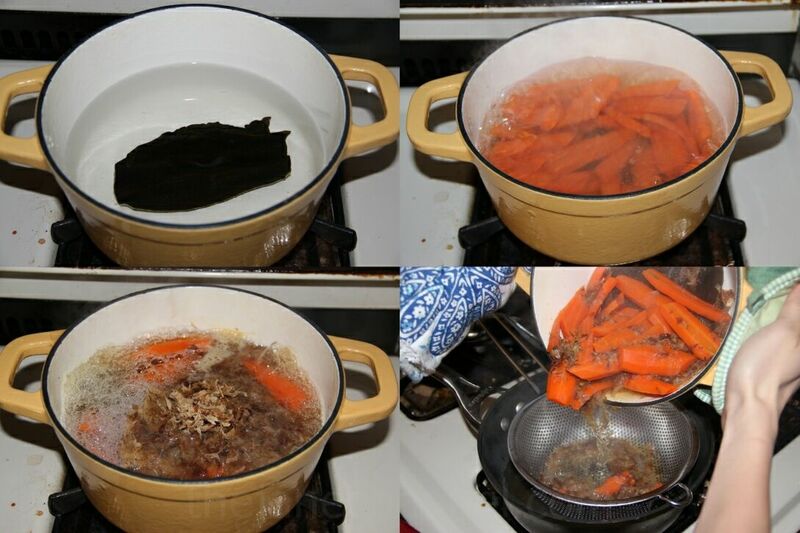 Soak 3 inches of kelp in a saucepan with 6 cups of cold water for 30 min. Set the saucepan over medium heat. Just before the water comes to a boil (you will see bubbles and it takes about 10 min), remove kelp. Add carrots and boil for 30 minutes. Add bonito flakes. Remove from heat and let stand for a few minutes. Pour the soup through fine strainer, discard bonito shavings and carrots. Bring the dashi back to to a boil. Next, we’ll add the following ingredients to the soup. Bring the dashi to boil, add miso paste and stir well until it is dissolved. Then add daikon and cook for 15 minutes. Add vermicelli and Napa cabbage and cook for 10 minutes. Add Salmon, Tofu and enoki. Bring it to boil, add sake and mirin. Sprinkle scallions to serve.